Are you looking for the best mattress covers for allergies in 2019? If so, you’ve come to the right place. I’ll share how to choose an allergy cover. The best allergy mattress cover can be a great addition to the bedroom, not only for its effectiveness against dust mites, bed bugs and feather allergens, but it can also work as a “mattress protector” that keeps your mattress looking new while improving bedroom hygiene. Our mattresses, pillows and blanket are notoriously dirty, yet most of us merely wash our sheets once every couple weeks. Believe it or not, standard sheets allow allergens like dust mites and pet dander to pass freely between fabrics where they can come in contact with your skin and even enter airways. If you have asthma, eczema, or are sleeping poorly, there might be something in your bed that’s causing irritation. It’s dust mites! The best mattress covers for dust mites can make a big difference in your quality of sleep. Along with a few other household changes, mattress covers have greatly improved my quality of life and help me sleep better. I’ve used a few different brands on my mattresses so I have a few recommendations. Tiny pore space allows air but not allergens to pass through fabric (no dust mite, pollen, or cat dander). Proven research and a wide selection of sizes including “crib size”. For kids and adults. Will last forever and keep mattress looking new. Breathable so you won’t sweat. Waterproof covers are good for allergic kids who are also bedwetters. Tendency to not be breathable and can lead to sweating. Not a good choice for adults. A few years ago, I was diagnosed with dust mite allergy. I was in bad shape and suffering from allergies. I immediately began looking for self-help solutions. I received a number of tips from my allergist. I also searched for dust mite information on the Internet. There was a lot of information, some good and some bad (and that’s one of the reasons I created this site). I quickly learned that our beds are the #1 home to dust mites. Why? Well, as gross as it is to think about, dust mites feed on our waste (dead skin). Don’t worry, dust mites don’t bite, nor do they eat living skin. We spend a lot of time in bed, so there is plenty of skin flakes in our mattresses, pillows, and blankets. Dust mites hide inside of our mattresses and pillows, then come out to feed on our shed skin. It’s disturbing to think about but dust mites also reproduce and defecate in our beds. Back in 2013, I purchased a mattress cover (also known as mattress protector or dust mite proof cover). I also purchased a special pillow cover and blanket cover. Mattress covers are a simple solution for families looking to protect themselves and their mattresses. They’re commonly used for people with dust mite allergy symptoms and/or bed wetting and they function as the most important layer of defense, keeping dust mites and bed bugs at bay while preventing dust mites from burrowing into mattresses. Allergen-proof covers can trap dust mites inside a mattress AND they can keep new ones from entering! Because they stay under bed sheets, mattress covers are rarely noticed. Adding them to a bed an easy decision. Better yet, they are an effective, non-chemical way to help you get rid of dust mites naturally. There are a number of mattress covers on the market. Some are used to protect from moisture and others are solely used for dust mite allergy and/or bed bugs. There are 2 types of dust mite proof mattress covers. The top spots, No. 1, No. 2, and No. 3 were given to cotton and microfiber covers that are thick, breathable fabrics and happen to be quite comfortable. They make your bare mattress look a lot better and let you sleep with peace of mind, knowing dust mites aren’t infesting your mattress or coming out of an old mattress. Reviews No. 4, 5, and 6 are waterproof, and while effective against dust mites and dust mite allergy, waterproof covers lack “breathability” and can lead to sweating. If a product says “waterproof and breathable” their claim is false. Review No. 7 is waterproof but only covers the top of the mattress. I included waterproof mattress covers because they might be a good option for children or people with bladder control issues. This is hands-down, the best dust mite cover for your mattress. I use it Mission Allergy on my mattress and pillows and it’s head and shoulders above other options I’ve used. After a few trials with cheap dust mite covers, I really did my research and found Mission Allergy. My allergist also recommended them and told me that an actual allergist created the company. It’s doctor-owned! Mission Allergy is known mainly for their bedding and offers additional high-quality covers for your pillow and blankets. If you want to side-step the “cover” the company also makes allergen-proof pillows and blankets. I’m pleased knowing Mission Allergy covers are made in the U.S.A.! Their technology has third-party research to prove it’s 100% dust mite proof – no wonder it’s a popular recommendation by allergists. It has a mean pore size of 2 microns which will block the smallest of allergens including dust mites and cat/dog dander. It’s made out of 100% polyester microfiber. The material is breathable and one of the tightest woven fabrics on our list. I sleep on it every night and don’t notice its there. Look no further if you need serious protection and comfort. The texture is silky soft and emits little to no noise when you run your hand over it. I purchased the Mission Allergy pillow cover 1st to give it a try, then returned to buy the more expensive comforter and mattress covers. The only negative about this product is the price, however, if you have serious dust mite allergy symptoms it’s worth the investment. For the past few years, I’ve slept well at night and no longer wake up with a stuffy nose. I have to give Mission Allergy at least some credit for that. To make it more desirable, it has a 10-year warranty. Due to the high quality and low wear and tear, I expect my cover to last much longer than 10 years! I also love Allersoft products. Allersoft makes excellent all-cotton allergy products that are proven to work. All of its products are made in the USA and 3rd party tested to ensure its claims are legitimate. The 3rd party testing measured pore space (space between fibers) at 3.4 microns which are much smaller than dust mite and animal dander allergens. It has a functional and secure zipper and is 100 percent breathable because it’s 100% cotton! This tightly-woven cotton mattress cover provides snug protection from dust mites and other allergens such as pollen, dust, and dander. Allersoft’s mattress cover is listed as a “best choice” by reviewers with mostly positive reviews. 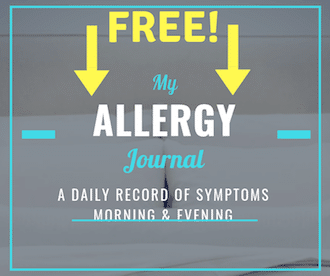 Many comments describe how Allersoft products have reduced their family’s dust mite allergy symptoms immediately and how the cover was soft, sturdy, and comfortable. Even if you don’t have allergies, this cover is a proactive way to help you sleep with more hygiene and protect your expensive mattress. Allersoft has a higher price point, but this is common when you purchase a quality product. As a bonus, it has a lifetime warranty (yes lifetime), making it our 2nd choice for best allergy mattress cover. Eco Living Friendly uses Evolon technology to produce “environmentally friendly” products and is an affordable option for those protecting against dust mites. I’m slightly confused by the “environmentally friendly” claim since this product is a synthetic polyester (possibly recycled material?). With that said, it uses no PVCs and has no chemical post-treatments which is great! According to one of the 500 mostly positive reviews, the material “is smooth and soft to the touch”. It’s also a dense material so we know it can hold up over time, so it’s understandable it has a 10-year warranty. The product, not material, is made in the USA! The more I read about this company, the more I like it. The Evolon material is similar to the more expensive option below by Mission Allergy and it even has a tighter pore space at 1 micron. 1 micron takes the cake as the smallest pore space on our list (if 0 microns then its waterproof). The fabric is German engineered – and you know the Germans and engineering – they are meticulous. The tight pore space makes it effective as a dust mite barrier under your sheets but allows it to remain breathable. The cover is also bleach safe. This means harsh chemical bleaching won’t impact its effectiveness against dust mites. Usually, I’d advise against this real harsh cleaning, but not for Eco Living Friendly’s Evolon mattress protector. This product is doing its job and growing in popularity as a dust mite proof brand. Some negative comments were about a weak zipper and possible tearing so be extra careful when putting it on your mattress! People with dust mite phobia and dust mite allergy can rest well with the protection of Eco Living Friendly and the Evolon material. Allerease’s mattress cover is polyester with an inner polyethylene film, which also makes it waterproof. I like that it uses a zipper closure with a convenient velcro flap to ensure bug bugs and dust mites don’t escape. The flap also reduces friction between your sheets and the zipper which has been known to cause wear in sheets. It comes with a wide variety of mattress sizes. In addition to moisture, it protects against dust mites, pollen, and animal dander. This product is not noisy or uncomfortable but might lead to sweating if you’re a hot sleeper. Additional reviews mentioned the cover being thin and “plastic feeling”. If you need an affordable option that is also waterproof, this is a good bet. Protection from dust mites, bed bugs, fluid, urine, perspiration, allergies, and bacteria. SafeRest has one of the most popular mattress covers on the market with 1000’s of positive product reviews. Advertised as having a cotton-terry surface (this means fuzzy cotton) with a waterproof and noiseless inner coating. Unless you use a mattress pad, you will likely hear some rustling at night when you sleep but the outer layer of cotton-terry does help tremendously to reduce possible noise. I doubt this subtle noise would bother children at all. Many SafeRest reviews tout its ability to keep out moisture, making it a good dual-purpose option for dust mite allergy and bed-wetting children. If you need an affordable dust mite and waterproof product, then consider this SafeRest cover. The inner seal which protects it from moisture might make it a less breathable option and cause sweating in larger adults. I like this product for its price point, predominately happy reviews and the fact that its backed by a full replacement 10-year warranty (yes, that is 10 years!). Another great aspect of the product is that it contains no phthalates, vinyl, or PVCs that could be hazardous to human health – these characteristics give it a nod for best waterproof allergy mattress cover. You probably haven’t heard of Spahr brands – neither had I until I did my research. They are somewhat new to the allergy mattress cover market but I like what they are doing. Similar to other mattress covers we mentioned, Spahr is bed bug and dust mite resistant and 100% waterproof. It is vinyl free. Yes, this means it might have problems with “breathability” however if someone in your family suffers from bed wetting + allergies then it’s a good option. When I was young I had a waterproof mattress cover for urine, but at that time I didn’t realize I had allergies. It did a great job to protect the bed from moisture and because I was so small I didn’t experience the night sweating that larger adults might have (more surface area with the cover). The Spahr allergy cover comes in 5 sizes at reasonable prices and although it’s not the quality we see in Mission Allergy, Allersoft, or Evolon, it does do a good job for moisture and allergy. The reason I decided to include this product was mainly due to its lifetime warranty against manufacturing defects. I really like warranties and Spahr has a good one. Of note: the protector is thin so be extra careful when putting it on. Once it’s on and under your sheets it should be ok. If you’re getting because of a pet, make sure your cat or dog doesn’t have long nails, otherwise, they could tear the allergy mattress protector – a mattress protector with a hole or tear won’t do its job of being waterproof and allergy proof. Linenspa comes in with our number 6 best mattress protector. We wanted to include this option in case you’re on a budget and only want a top cover. 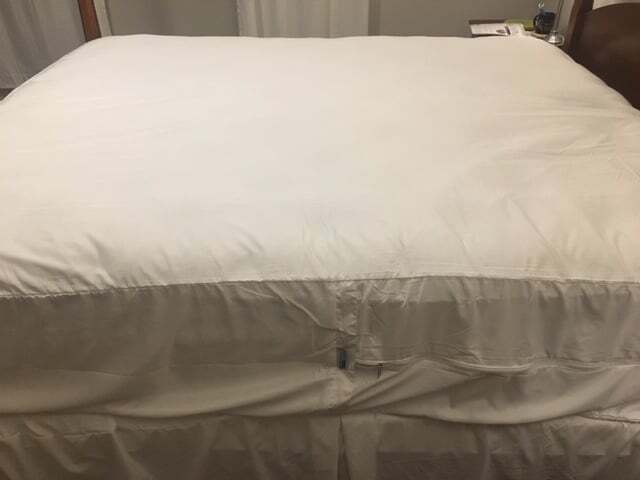 Note that this cover does not cover the whole mattress, only the top portion – similar to a fitted sheet. If you or your family has serious allergy or asthma to dust mites, then this is not the best choice for protection. If the allergies are minimal and bed wetting is a problem, then we recommended it as an alternative to the others on our list. We like that it comes well-reviewed and in all common bed sizes (also with pillows). The reviews are plenty with literally 1,000’s of positive reviews and comments. I enjoy reading comments that state “we noticed a problem with the stitching after 4 months and contacted Linenspa – they sent a replacement immediately”. Great customer service and a willingness to stand behind a product aren’t as common this day in age (check prices and reviews on Amazon). For my severe allergies I have to go with others on our list, however, don’t let me keep you from purchasing Linenspa. They might offer exactly what you need (waterproof and minimal allergy protection). Both Mission Allergy an Allersoft are legitimate allergy companies. They are not gimmicky brands trying to make a buck in an underserved market. They really try to help consumers who suffer from allergy. You can tell by their emphasis on 3rd party testing. You can also see from their other quality products, reviews, and by their websites, especially the Mission Allergy website. Both of our picks cost a bit more than the competitors, but in my opinion, they will last as long as your mattress. Even though they have a 10 year or lifetime warranty, the quality fabric will never need replacing (only the zipper if there is some kind of malfunction). Don’t make the same mistake I did and buy cheap covers, only to need replacements a short time later. And don’t forget, these covers will keep your mattresses clean looking like new. My first 2 dust mite proof covers weren’t exactly great experiences. Long before I was given advice by my allergist, I suspected dust mites or another bedroom allergen might be giving me problems. I traveled to the nearest box store and picked the cheapest cover on the shelf. The brand I purchased from was a well-known allergy brand but they didn’t (and still don’t) use 3rd-party testing for their products. In other words, their claims to prevent dust mites may or may not be true. I do believe they were effective against dust mites for 1 reason: their products use an inner polyurethane lining (plastic). However the material was thin and after a few washes, it tore, making the product useless. With my initial purchase, I also experienced sweating because the plastic inner layer wasn’t breathable. For young kids who are allergic to dust mites and are also bedwetters, the polyurethane might be a good option, however, for an adult, it wasn’t comfortable (I had waterproof covers on my mattress AND pillow). After learning from my allergist about the best allergy covers, I made much better purchases the 2nd time around. Below are my reviews for the best allergy mattress cover. Allergy mattress covers, pillow covers, and comforter covers don’t require a lot of maintenance. You should be washing your bedding (sheets) weekly with added essential oils (use essential oils to kill dust mites) to kill dust mites, but your washing won’t include your mattress covers. The great thing about mattress covers is they go on underneath your regular bedding so they are largely protected from wear and tear, and because they are allergy-proof you don’t have to worry about them. It’s wise to wash a once or twice every 6 months to wash any sweat or stains from the cover. Bleach is a harsh chemical that has a tendency to wear down clothes so instead, give the cover a long pre-soak and thorough washing to clean them. Hang them out to dry (if no pollen allergies) and they are ready to go for another 6 months. Mattress covers are a great addition to any household looking to improve their sleep environment. While especially helpful with people suffering from dust mite allergy, mattress cover limit contact with dust mites and bed bugs. They can also be multifunctional and assist individuals who are bed wetters. The best allergy mattress covers can be installed on a new mattress in minutes to ensure it stays dust free. It can also be put on old mattresses to keep dust mites inside the mattress. In this article, we reviewed the best mattress protector for allergies. We discussed possible symptoms of dust mite allergy such as rashes, asthma, sneezing in the bedroom, conjunctivitis, rhinitis, and fatigue. Fatigue from lack of quality sleep, and rashes were my biggest challenge. After discussing my allergy with my allergist one of the first things he recommended was to make the bedroom dust free. The process included cleaning the room and getting dust mite covers for my mattress, pillow, and a duvet cover. Initially, I visited a department store and bought the cheapest option. Little did I know it would be hot and uncomfortable and make from cheap polyurethane. It was noisy and I didn’t like hearing the plastic sound every time I changed positions. I was sweating a lot at night because of the lack of breathability. The cover didn’t last long and I had to purchase a new dust mite cover. Eventually, I found Mission Allergy and Allersoft products. They focus on comfort and have 3rd party research to back their claims. I learned about pore size and how it determines whether dust mites and pet dander can penetrate the material. I also began reading more about warranties and found that the trusted brands have amazing guarantees (10 years up to a lifetime). I’ve used Mission Allergy and Allersoft for a number of years, but I also like the like Evolon fabric for dust mite protection. If you need the waterproof option, feel free to look at our No. 4,5, and 6 options. In my opinion, they are good for kids, but not a good option for adults. It really depends on your individual needs (some people want a mattress protector for their pets!). Purchasing one of the best allergy mattress covers should result in more sleep and a peaceful state of mind. It will also keep your mattress looking new. Be sure to check out pillow covers and duvet covers as well. We hope you enjoyed our review for the best dust mite mattress covers. Thanks for reading!